A smart downlight isn’t a light fitting that’s been to university. It’s not got a degree and isn’t educated to a higher level. The thing that makes them smart is a smartphone. The ingenuity of the smart phone is allowing us as a society to do a whole lot more, especially with lighting products. With this in mind, can any lighting product become smart? The answer is yes. You can convert most types of lights into smart lighting products by using an accessory such as a smart light switch or receiver. If you’re considering buying smart lights because you want to control them from your phone, the lights themselves don’t have to be smart, even old-fashioned halogen lamps can become smart without needing a degree in smart lighting. All you need is a smart switch which replaces your existing, ordinary dimmer or wall switch and converts it into a smart lighting circuit. A hub acts as a gateway, communicating between your smartphone and smart devices like switches, power sockets and smart lighting products. A hub still requires a Wi-Fi network to operate on. TCP Smart switches don’t require an additional hub. The App on your smartphone communicates directly with the device. Hubs cost around £100, although once you’ve got 1 you can use it on around 80 lights or devices throughout your property. If you want to experience more advanced lighting modes, then you may want to consider lights that feature colour temperature adjustable or colour changing technology. Otherwise you’ve just got a glorified dimmer switch that operates from your smartphone. Most Apps will offer other benefits like timed settings and scene control, but for a more prudent investment, smart LED lights can do a whole lot more. Most dedicated smart lighting products do more than just switch on/off and dim, they adjust in colour temperatures meaning you can transform the colour tone of your room in an instant. Or change the colour completely from an ambient white light to red, green, blue and anything else in-between. Fully integrated LED smart downlights such as the TCP Smart 8W downlight which is shown in the image below. This particular downlight comes with everything you need. Your smart phone communicates directly with the downlight, it doesn’t need an additional hub or smart switch. Integrated LED downlights such as the Aurora AOne MPRO ZX requires an additional hub. Some would argue that more advanced home automation systems can do more with a hub, but it depends on what you want to achieve and how much you’re willing to spend. 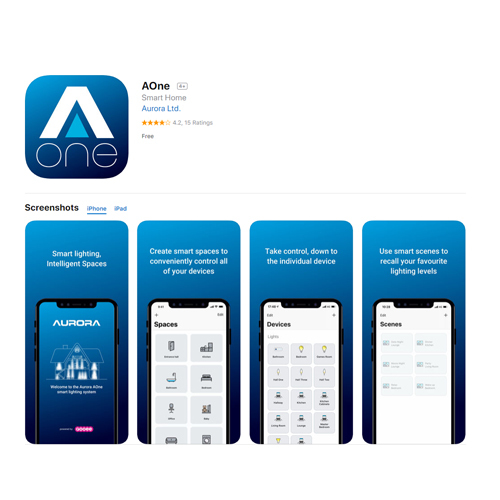 The Aurora AOne system has a large selection of add-ons that allow you to control any types of lighting products from your smartphone, or with a handheld remote or wall switch. Smart light switch: by replacing your existing light switch or dimmer switch with a smart light switch, you can convert the light fittings on the circuit into smart lighting products. The App on your smartphone then communicates with the light switch, which then communicates with the lights. Depending on which smart light switch you choose, you may also need a hub. For example; TCP Smart switches (shown below) don’t require a hub but Aurora AOne does and so does Lightwave. A smart receiver can be wired into a lighting circuit to convert your existing lights into smart lights. 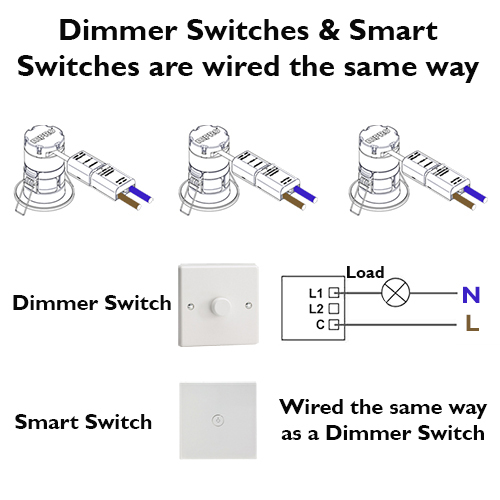 Also also known as an inline dimmer as its wired either in-between the lights directly to the power, or between the lights and a switch. You could have a normal light switch on the wall to provide local switching. When the light switch is on, the receiver will be active, ready to communicate the signal from your smartphone to the lights. Depending on the wiring, if the light switch is off, the circuit won’t have any power and the App won’t be able to detect it. Smart receivers are great for controlling LED tape with a smartphone. You can use a standalone system for this with an RF receiver and a Wi-Fi hub. Or you can integrate this into your system. Depending on which brand you go for, control of LED tape might be limited to just switching, while other systems can perform complete colour changing controls. Some brands such as Lightwave only offer electrical accessories such as switches, power sockets and heating controls. Some brands only do light bulbs and downlights, but some brands like Aurora do it all with their AOne Smart series. Choosing the right brand for you depends on what you want to achieve in your home automation lighting adventure. You might be considering installing a complete home automation system like Lutron or Crestron that needs programming and additional components just so you can dim your lights from your phone. Or you might just be interested in a set of smart downlights for one room that you can switch automatically with a timer setting. If you’re looking for a low-cost system, then the TCP Smart range would be my first recommendation. This system is limited though as they only currently have 1 and 2 gang smart switches. Its better for a room by room basis rather than for entire homes. If you’re looking for a retro-fit-solution (i.e. replacing your existing switch) Lightwave Smart Series (formally Gen2) is a great system with a full range of smart switches from 1 to 4 gangs. 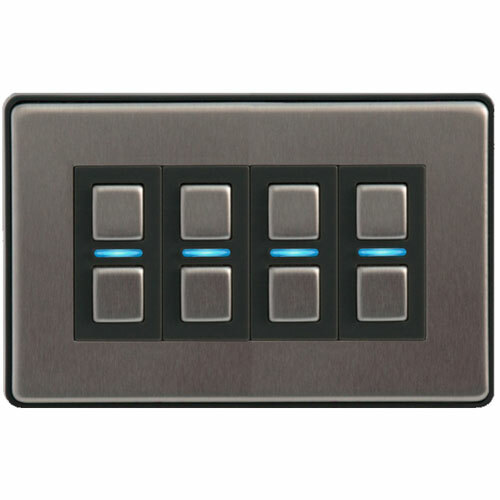 Their switches can be programmed to master or slave operation and do 2 way or even 3 way dimming – this basically allows you to dim the same light from multiple locations in the room. Lightwave Smart Series also has two-way communication, which means that the App always knows which items have been switched on and off. It can also monitor energy usage without needing an additional accessory. But they don’t do lighting products and their range is quite limited, especially if you want to control LED strip tape or any other non-standard lighting products. The Aurora AOne smart system is the best for lighting, it inspires more confidence because they have fully tested their lighting products with their smart lighting system. You don’t need to take a gamble or perform your own tests for compatibility, Aurora have already done this for you and can be found here. For those who’ve dabbled in smart lighting products in the early days, you may have multiple Apps that all do different things. Your ideal scenario is to have one App that controls everything. That way you can set a scene for multiple lights or power sockets around your home and at the touch of a button or timed sequence everything switches off. The possibilities are almost endless especially if you’ve got colour changing lighting. 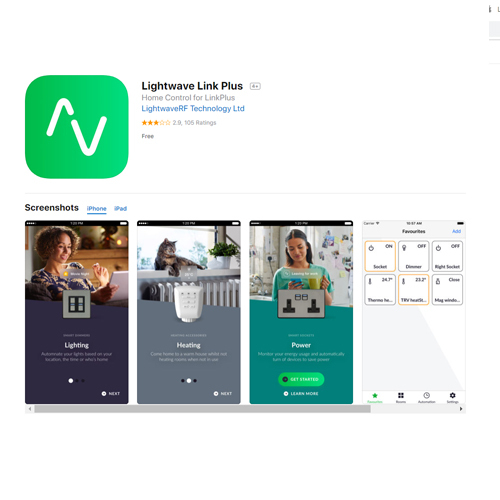 Remember; the App is the software you will use daily to control switches/sockets/lighting, therefore it’s worth comparing which App will work best for you as a priority. Some systems like Aurora AOne can operate on their App using the dedicated AOne hub, or you can purchase the cheaper priced Samsung SmartThings hub and use their software instead. This is because both operate on the Zigbee protocol. Conveniently switch, dim, or change colours from the comfort of your smartphone. Group lights together into rooms or zones and control them individually or collectively. Scene setting – at the touch of a button you can, for example: dim a group of lights in one area of the room to 30%, switch on a table lamp, change a colour temperature from cool white to warm white, turn your LED strip tape to red etc. Any combination that your lights are capable of can be set to a “scene” and name accordingly e.g. Party Scene, Goodnight Scene or Cosy Night-In Scene. Automated timed sequences mean you can set automation’s that switch your lights on and off at certain times of the day. Perhaps you’re away on holiday and you want to pretend your still home? A good advert for smart lighting products could be for a new Home Alone movie with Macaulay Culkin sat chilling while pressing buttons on his smart phone to put off intruders and protect his home. One of the most popular reasons to purchase a smart downlight is for voice control. Voice activated dimming can easily be achieved with many systems. Along with an Alexa or Google Home device, you can use your voice to control your lights. You just have to set up the commands and your voice becomes a type of switch. Currently their aren’t too many smart downlights available with colour changing effects. The Crompton Spectrum downlight has a colour temperature adjustable main central light and a colour changing rim. The rim (shown in the image below) provides a halo effect. Using the Crompton Phoebe Spectrum App or smart switch you can adjust the colour temperature and change the colours of the halo. Their App is limited to controlling just this downlight, you can’t add other products to the system. The Philips Hue GU10 LED kick-started the industry and remains the market leader but it comes at a price. For example you can get 3 TCP Smart GU10 LEDs for the price of 1 Philips Hue. On its own, it’s just a smart light bulb that needs a light fitting such as a downlight or wall light to house it in. The Philips Hue is physically deeper in size and requires deeper GU10 downlights such as the Integral EvoFire. 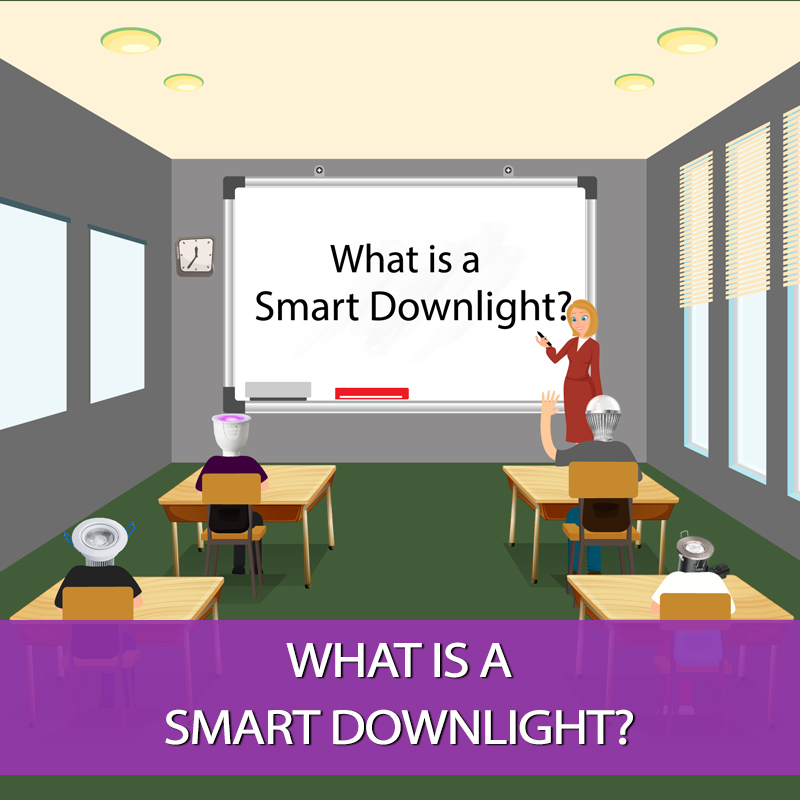 Once you install a smart lamp into a downlight, you’ve essentially created your very own smart downlight. You can now purchase integrated LED smart downlights that have everything in one unit. These are not only easier to order and faster to install but they cost less. When you compare all of the components involved in a Philips Hue setup like the LED, bridge and downlight with a TCP integrated downlight.